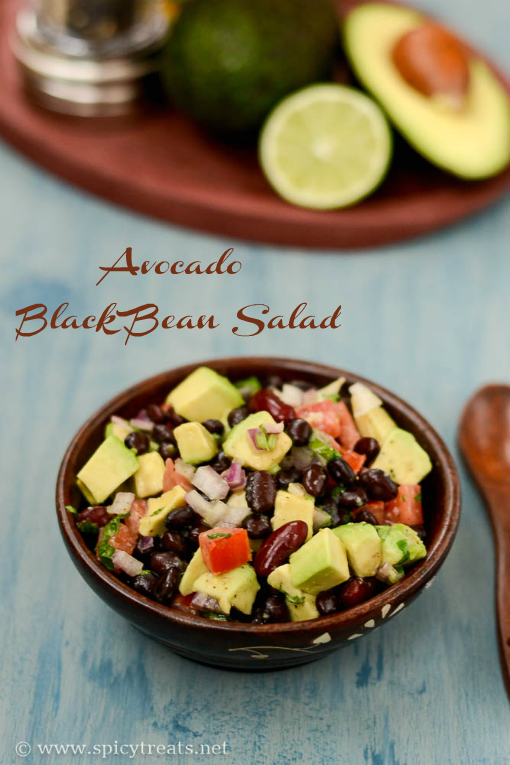 Today's recipe is a simple, quick and healthy salad prepared with Avocado & Black Beans combo. This salad has a wonderful taste and flavor with tangy and refreshing lime vinaigrette dressing and also a protein & fiber rich recipe, a perfect diet menu too. 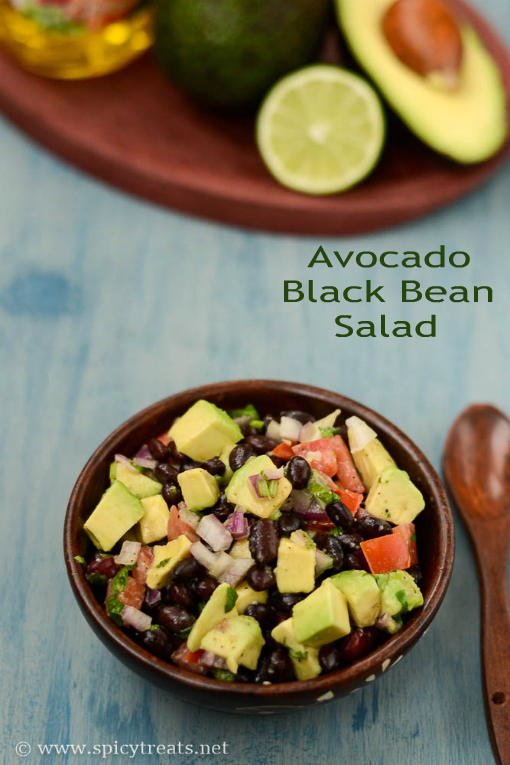 Avocado in this bean salad makes it a super filling and delicious salad, I sometimes eat this salad alone for lunch or dinner as a meal. 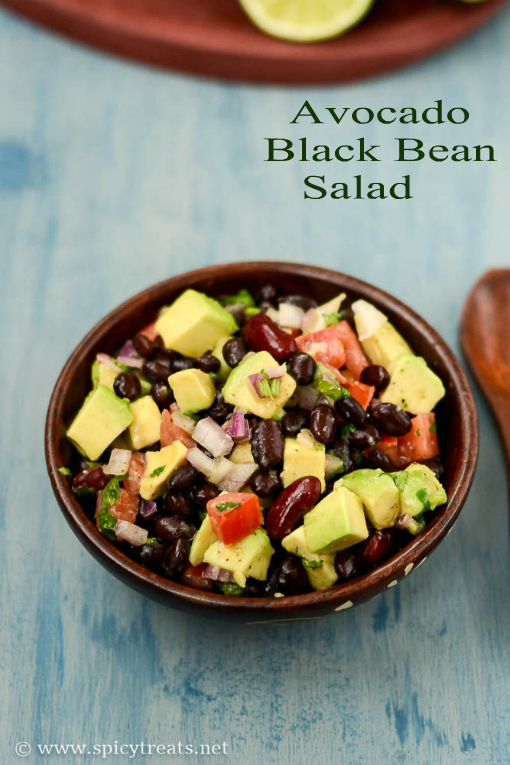 We like this kind of legume salad with or without avocado and with black eye beans or chickpeas or mixed beans combo. Lime vinaigrette is so refreshing and perfect to balance the creamy taste of avocado. Here, i used garlic powder for dressing but you can also use freshly grated or finely chopped garlic. 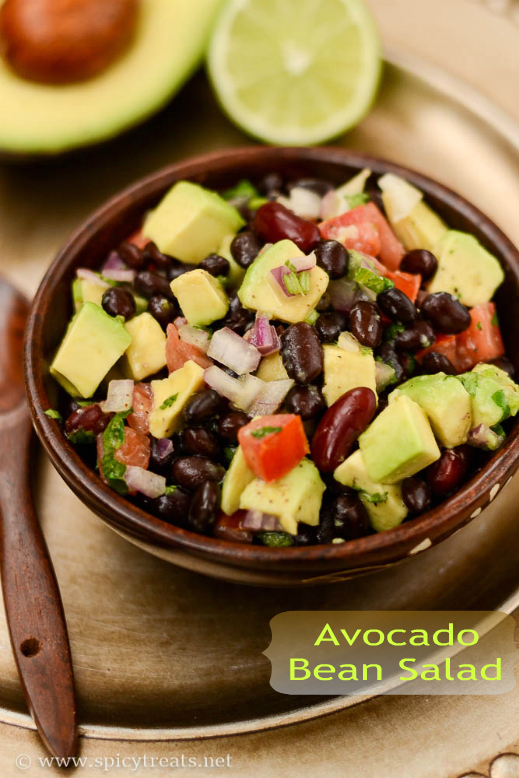 Now off to the wholesome and delicious avocado black bean salad.. I used pressure cooked black beans and kidney beans, you can also use canned ones, if so rinse well before using. In a small mixing bowl, add all the ingredients for lime vinaigrette, and stir well(taste dressing and adjust salt and pepper to taste) and keep ready, if you want you can also prepare ahead and keep it in refrigerator. Then in a large mixing bowl, add black beans, kidney beans, onion, tomato, cilantro and mix well. After that add avocado and lime vinaigrette, give a gentle stir and serve immediately. Thank you for the recipe. Do you have any tips on avocado looking fresh for a long time. I want to pack this for lunch. It is recommended to store avocado in the fridge until use, and while packing for lunch just cut into 2 halves make slits squeeze lemon or lime juice all over wrap with plastic wrap and keep it in separate box. This way avocado remains green and fresh. Hope this helps. Thanks.